Estimating the impact on house prices in the aftermath of Brexit is not an easy task. If we were to compare the economic crisis of 2007 and the consequential slowdown in business and sales transactions that followed, we would see that the impact felt as a result of Brexit has been far less dramatic than people might have feared. Interest rates are expected to remain at their current low levels for some time to come, which is encouraging and is fuelling the London sales market in many ways. As a result of the fluctuation and weakness of the pound since the vote to leave the EU we are now also seeing many foreign buyers returning to the market. This said, there is a now a shift away from buyers stepping up the housing ladder compared to Q3 last year and this looks set to be a trend that will continue until the politics of Britain’s negotiations to leave the EU become more apparent. Stamp duty is increasingly being used as a taxation tool by the government, whether that be in the reduction of tax relief for buy-to-let landlords, a stamp duty surcharge on investment properties and second homes, or the extremely high rate of stamp duty applied at the top end of the market. This is impacting particularly on properties over £3m. Properties at the top end of the market, which saw the biggest increases in stamp duty, have seen falls over the past year of a similar scale to the increased transaction costs. For example, properties priced over £5m have seen annual falls of -4.7% compared to an additional stamp duty rate of +4.1%. 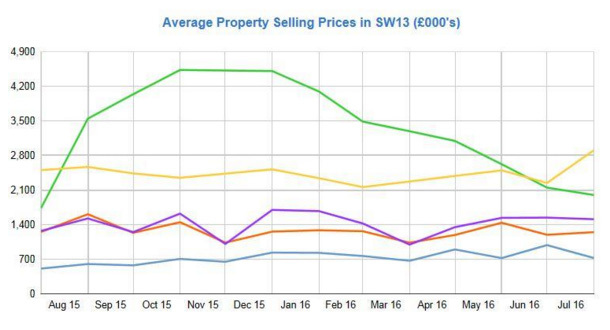 House prices in Barnes remained stable and we expect much of the same for the first two to three quarters of 2017. Voted as one of the best places to live in the UK, and voted Number 1 in Greater London, Barnes remains one of London’s most desirable residential locations, as proven by the fact that many existing residents continue to choose to look at either up or downsizing within the area, rather than moving elsewhere. More and more central London buyers are moving to Barnes and with the Olympic Cinema, the new Marks and Spencer Food Hall and the attraction of some of the country’s most prestigious schools it remains one of the most sought after places to live.